ADAMS, John Quincy (1767-1848) was an American statesman who served as the sixth President of the United States from 1825 to 1829. He also served as a diplomat, a Senator and member of the House of Representatives. He was a member of the Federalist, Democratic-Republican, National Republican, and later Anti-Masonic and Whig parties. Partly-printed Document Signed “J.Q. Adams” as President of the United States, 1pp. 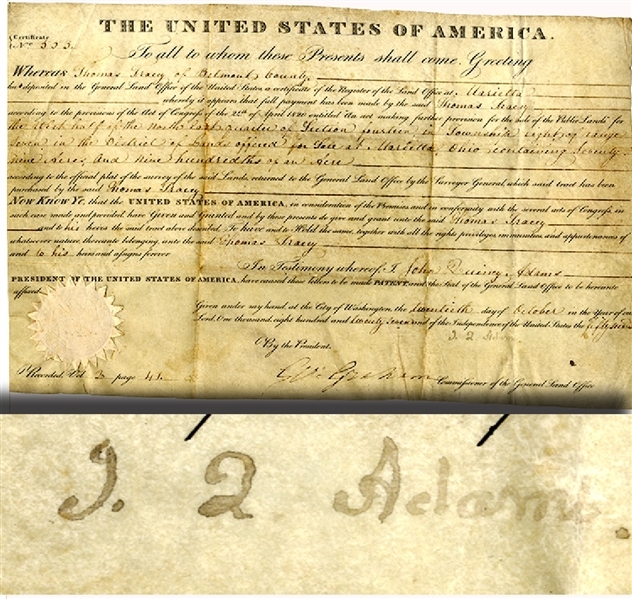 oblong folio, parchment, being a Land Grant, issued October 20, 1827 to Thomas Tracy of Belmont County. Counter signed by commissioner of the U.S. land office, George Graham.VG.